Arktos & Walker play in the Highland Wildlife Park - both our patients. We have provided specialist dental care for the animals of Edinburgh Zoo and others institutions, most notably the Hong Kong based charity Animals Asia, since 1992. This link takes you the BBC site describing a recent surgery on a polar bear. Over this period we have acted in partnership with the resident veterinary teams to treat various oral problems in various species. This includes all the large carnivores including Lions, Tiger (Amur and Sumatran), Jaguar, Leopard, Cheetah, African Wild Dog. Tiger team at Highland Wildlife Park; male Amur Tiger ready to root canal fill fractured lower right canine. We have been fortunate also to work with three Polar Bears, Sun Bears and numerous Asiatic Black (Moon) Bears, the latter in Cheng Du, China at the invitation of Animals Asia. We also experienced a large number of primate species including Lowland Gorilla, Chimpanzees and many smaller monkeys such as L'Hoest, Squirrel Monkey and Lemur. More unusual animals include Pygmy Hippo, Red Panda and Babirusa. Some of our more unusual patients can be seen below. This chimp has a sinus discharging below his left eye. A gutta percha stick was placed in the sinus to try to identify the origin on an x-ray. The left upper canine is the suspect at this stage. The middle image shows two fractured central incisors but the canine on his left side is intact. The x-ray on the right identifies his left central incisor as the origin. The other incisor is none too healthy either. This African Wild Dog called Kenya had multiple fractured canines from fighting and is undergoing root canal treatment. These dogs live in packs and frequently fight in dominance struggles over food. This lioness has a previously root filled lower right canine from her previous zoo - note the cut down crown and amalgam filling. She was new and was behaving very badly with the others in the pride. Her keepers suspected another fractured canine. This was found to be true - see right upper with root canal file in open access at tip. Another tooth was also fractured. Both were root filled and her bad behaviour settled down. Serious toothache obviously! This shows well that felines only need to lose 1 - 2mm of the tips of their canines to open the pulp and allow access to infection. This is true for the domestic cat to the largest lion. These images show a Moon Bear (Asiatic Black) coming into hospital theatre and being intubated for surgery. This bear has a missing left fore paw from being wild trapped. It was also rescued from a Bile Farm. Bile Farm life is horrific with bears confined in small cages wit no room to turn round. Bile is drained frequently from a catheter in the gall bladder. Many have the gall bladders removed once rescued and undergo root canal treatment of fractured canines at the same time - see below. Animals Asia do wonderful work in this regard. The bears spend the rest of their lives in the safety and comfort of the rescue centres. Upper right canine extracted surgically in a Moon Bear as root apex too fragile & diseased to be root filled. 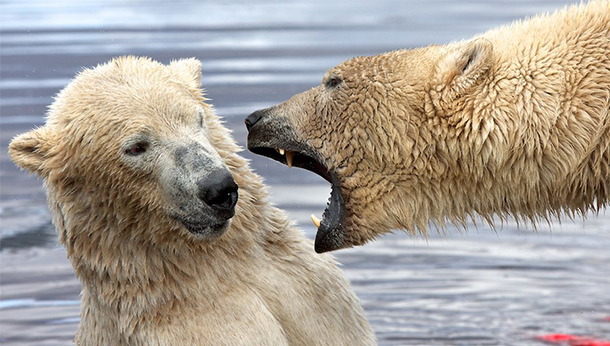 Polar Bear dentistry is frequently al fresco! These patients weight around 250kg so can be a real challenge. The bear below right had three fractured canines root filled in two separate sessions. The polar bear (above left) fractured a lower canine early in his life leading to a discharging sinus under the jaw. The tooth had never matured and root canal treatment was not possible making a difficult surgical extraction inevitable. The wound required around 70 sutures. Note the size of the tooth with thin walls and an open root apex. 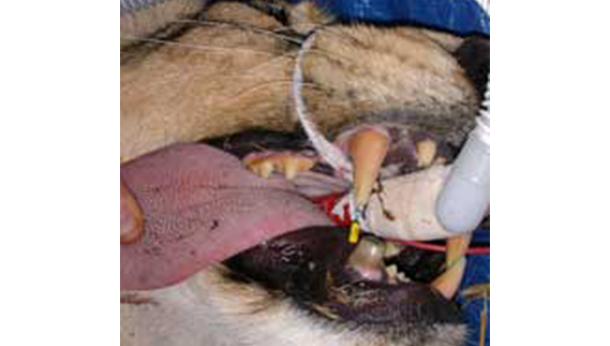 This Siberian (Amur) tiger had a fractured upper premolar 3. Big cats - like small domestic cats - can lose very little of the tooth before the pulp is exposed. All cats appear to go through inflammation to pulp death very quickly. Above is a Red Panda having a fractured canine root filled after a fall and a Babirusa wild pig that needed a tusk shortened. This Pygmy Hippo had a sinus near the right upper tusk. The upper tusk itself was healthy but the lower was making traumatic contact with the oral mucosa. A tusk reduction and direct pulp cap was performed. Fred had a deviated tusk from an accident when young. Occasionally it needed "trimmed" to keep it away from the side of the face. The pulp in his tusks was far from the wearing surface. Dental care of wild animals is very different from our normal domestic species. Firstly, the need for intervention almost always is due to close attention and observation by the keepers. Secondly, the actual anaesthetic procedure often carries a high degree of risk. To that end we aim to complete the procedure as quickly as possible with a regimen that allows rapid return to function without the need for regular repeat procedures.